Six individual episodes comprise Shout! Factory's newest release based on Ludwig Bemelman's cherished classic children's series in Madeline's Great Adventures. Narrated by Christopher Plummer, the six unique escapades have been transferred from the animation show inspired by our favorite Parisian boarding school student which visibly appears to have been drawn by two different illustration houses and/or reconceptualized midway through as evidenced in this roughly 130 minute disc. Yet irregardless of the aesthetic style of the series, the one constant running throughout is the overall respect and love that those involved have for Bemelman's source material. 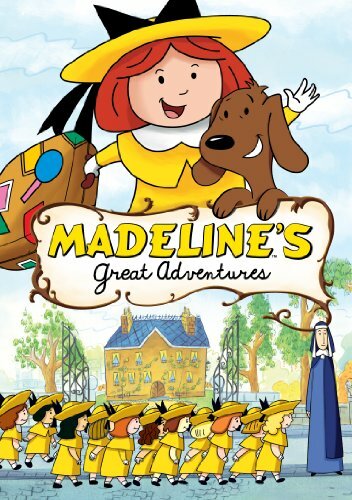 And throughout the episodes, Madeline, her faithful dog Genevieve, eleven classmates and neighbor boy Pepito embark on an engaging collection of wildly entertaining adventures from traveling to Africa or meeting diverse individuals from other lands that have come to Paris such as a young prince who just wants to be a boy or saving a child just about Madeline's size who happens to be a genie in a bottle. And whether it's discovering that magic can be found whenever one finds a true friend or realizing that loyalty, bravery and the courage to stand up for what's right is important at any age, the morals are nicely blended in with the storyline in such a way that young viewers will uncover them right along with Madeline and Pepito.